If you are interested in a fabric, when using the email link below, could you please add the fabric description I am providing with each fabric listing somewhere in the email, otherwise I won’t know which fabric you are referring to. I always take the fist email in the line if a few people are interested in a fabric and if you send an email without the fabric name, even if you are first in line, it will go to the person who first includes the fabric name. Thanks! Please just note, usually before I photograph my fabrics and then before I send them out, I give everything a nice press. I am not doing it with these fabrics…part of the reason that I am offering them at such a low price. They have been folded up and kept in tubs, so please just keep in mind that some pieces bear creases and do not come as though they are cut fresh off a roll. 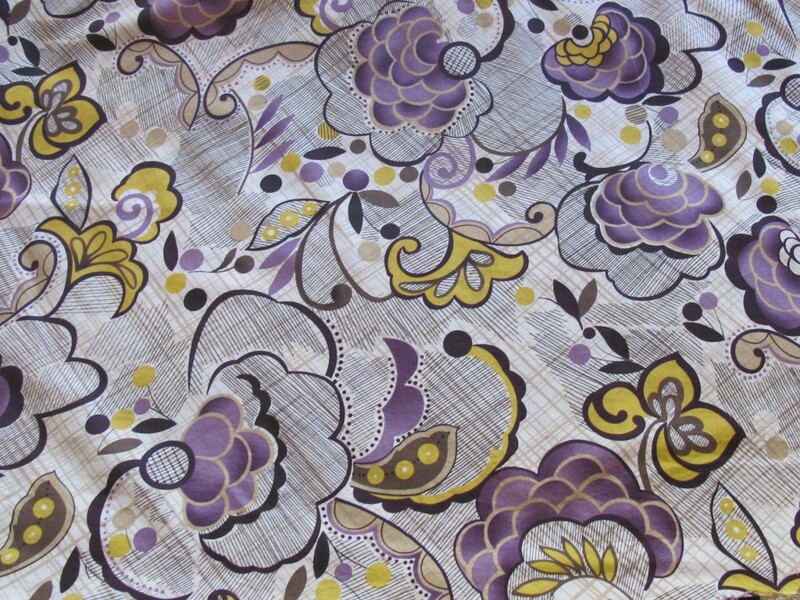 Light weight cotton – thicker than a voile and semi-opaque – with a deconstructed paisley pattern, from a NYC garment fabric store that stocks mostly designer fabrics, this one was originally close to $20 a yard. 140cm wide x 2 metres. $8/m/$16 for the piece. Yes, Miuccia does these sorts of cottons over and over again. This is a lightweight cotton, a shirting cotton, opaque and soft. I’m not sure that it is a ridgy-didge seersucker but it has that scrunched up effect…subtle, so that it just creates some textural interest. This piece is 140cm x 2 metres. $8/m/$16 for the piece. This fabric is deliciously swishy and fluid and has some weight to it so it will drape and hold its volume beautifully. The print features a small-scale graphic with classic black, tawny and grey colours. 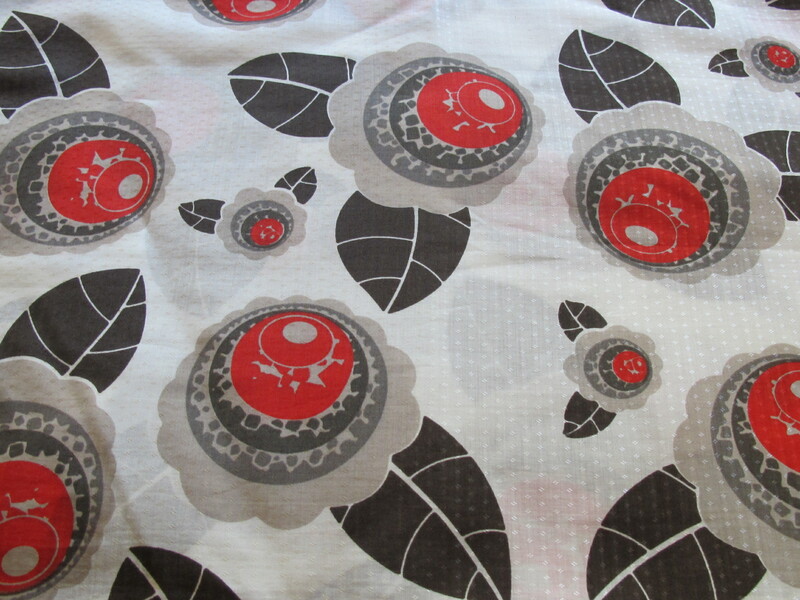 The fabric width is 150cm and the width is a neat 1 metre, so this is an $8 piece. The width will allow you to cut tops, even swishy skirts or shorts. 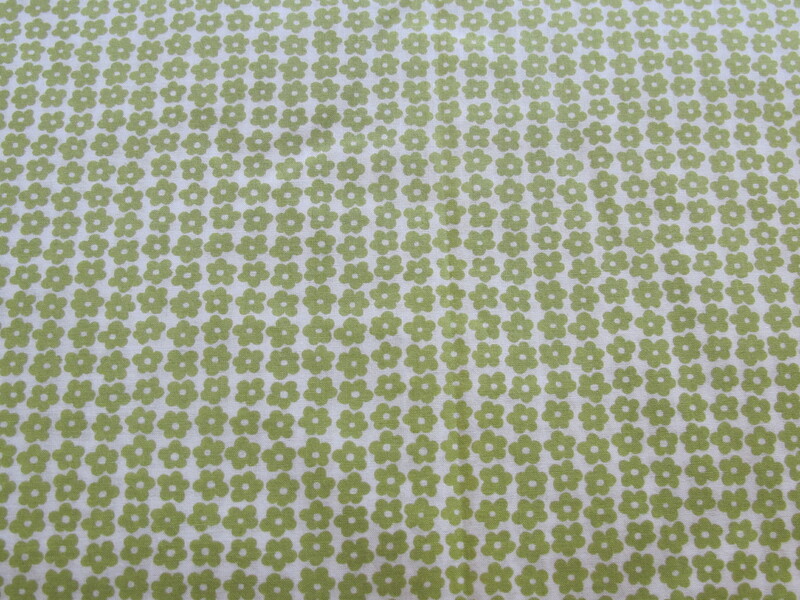 This cotton is a European designer cotton, could be a Hug0 B0ss cotton, I’m not sure, but it is a designer like that. I got this piece from one of my fave NYC stores and paid nearly $20/m for it. The background is a fatigue green with beautifully blended ellipses showcased against it in shades of blue and green. it is a light weight cotton, semi-opaque. The piece measures 150cm x 2 metres (just a shred under actually, but I’m calling it 2). 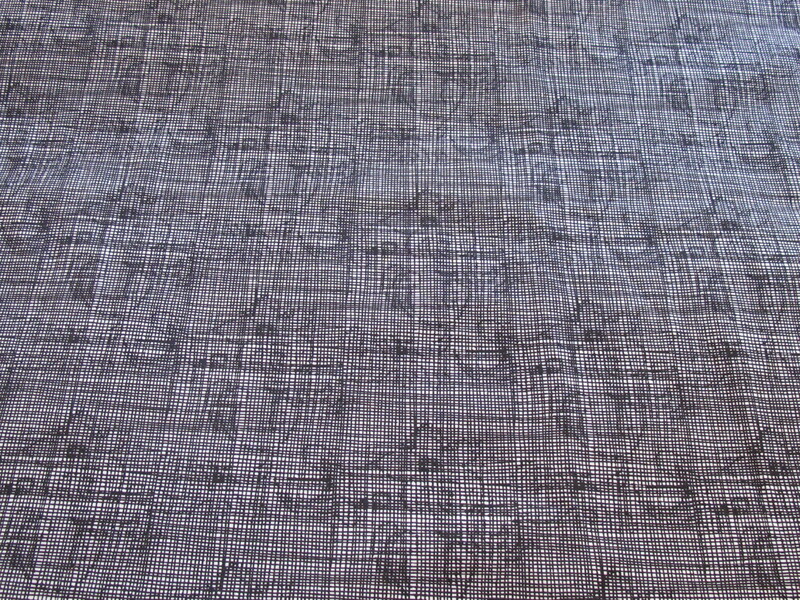 This fabric hails from one of Australia’s top designer fabric stores and was priced somewhere between $20 – $30 a metre. So it is a quality offering, but I’m a bit unsure of the final composition now. It could be a rayon or viscose and cotton blend? Whatever, it has a very soft hand, is 90% opaque and will be just fabulous for tops, blouses and so on. Fabric is 150cm x 2 metres/$16 for the piece. I don’t know why I’m describing this as a safari print but the name is stuck and I can’t move on from it. I love brown, and I especially love brown and black together. 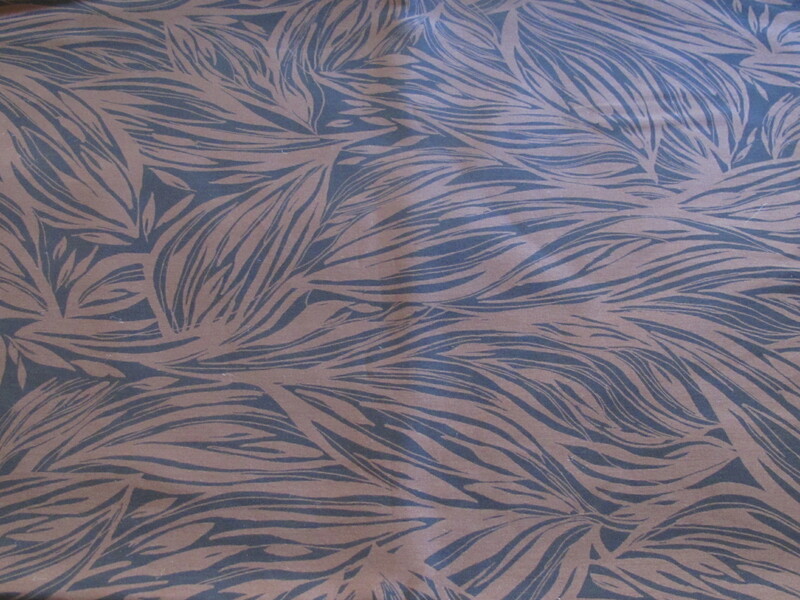 Of course, it is not a colour for everyone but if you do like browns, then this would be a great fabric to snaffle up. 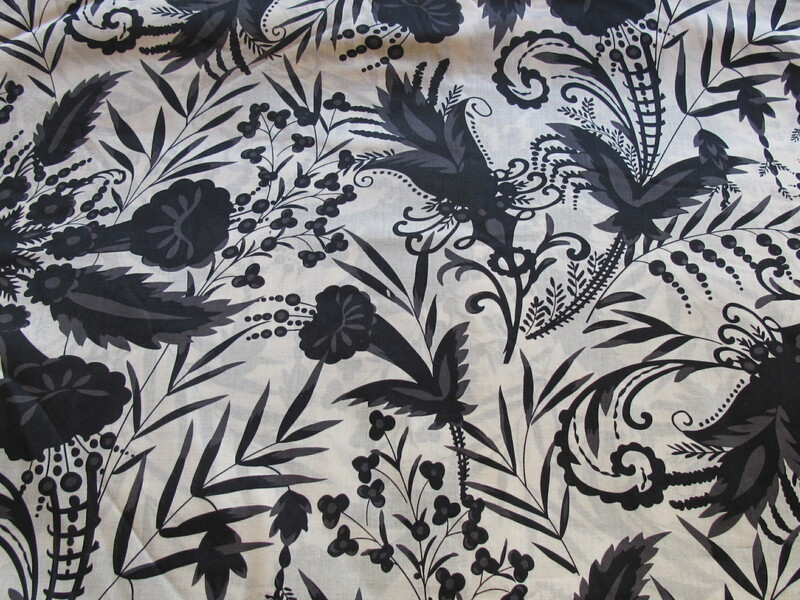 It is from an Australian fabric designer store and was also in the $20 – $30 dollar a metre bracket. This is a shirt weight cotton, light but densely woven, completely opaque, soft to the hand. Just lovely! 147cm x 2 metres/$16 the piece. This one is another lightweight cotton, but perfectly opaque, and with a touch of mechanical stretch in it. Hadn’t noticed that before! It’ll be great for wearing ease. The print background is a faint diagonal check and this is overlaid with op-art sort of flowers and scrolls. This would make a fabulous shirt. The fabric width is 125cm and the length is 2.10 metres/$16 for the piece. Some of you may know that the Japanese seersuckers can sell for quite pricey amounts. But not this one! 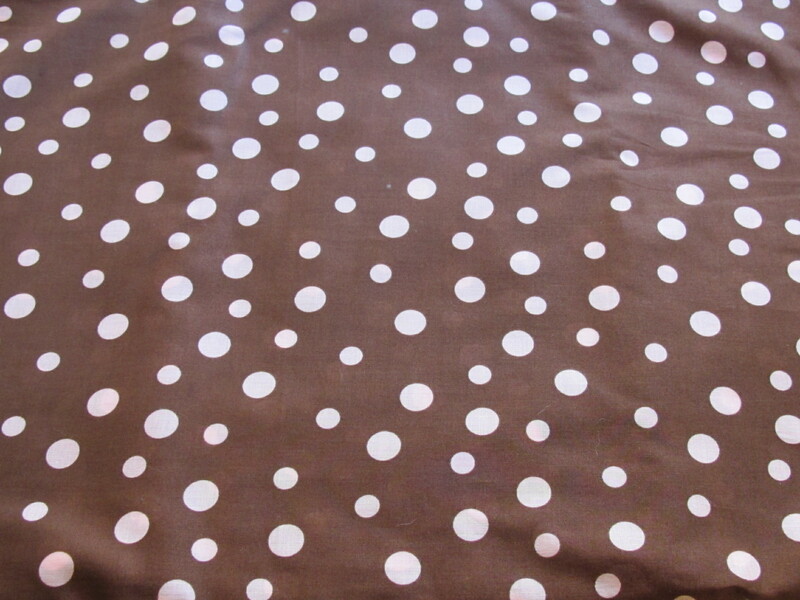 It is a lovely lightweight cotton, mostly opaque, and the tiny dot print is completely classic, just ready for great shirts or tops. The width is 112cm and the length of this piece is 2.1 metres/$16 for the piece. 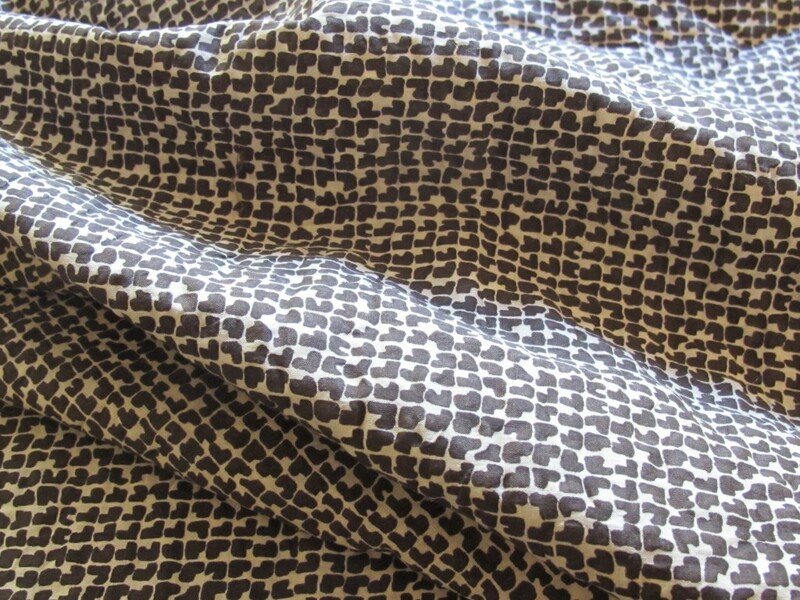 Another lightweight cotton here, semi-opaque, closer to a voile than a shirt weight cotton but still plenty of coverage. The print features a small square graphic with scroll corners and tiny flowers inside, repeated in rows and columns across the fabric. The width is 112cm and the length is 2.4 metres, but I’ll still let this one go for $16 for the piece. Is this a broderie anglaise? I’m not sure if the broderie anglaise must feature a more dense cut-out pattern, but I do actually think this one qualifies one. I think this is 100%, if not, it is very close to pure cotton. The cut-outs are small flowers, like daisies. The fabric width is 146cm and the length is 2.5 metres. At $8/m, the price for the piece is $20. Black can appear washed out in photographs but the black of this cotton is a true black. This one is a medium weight cotton. 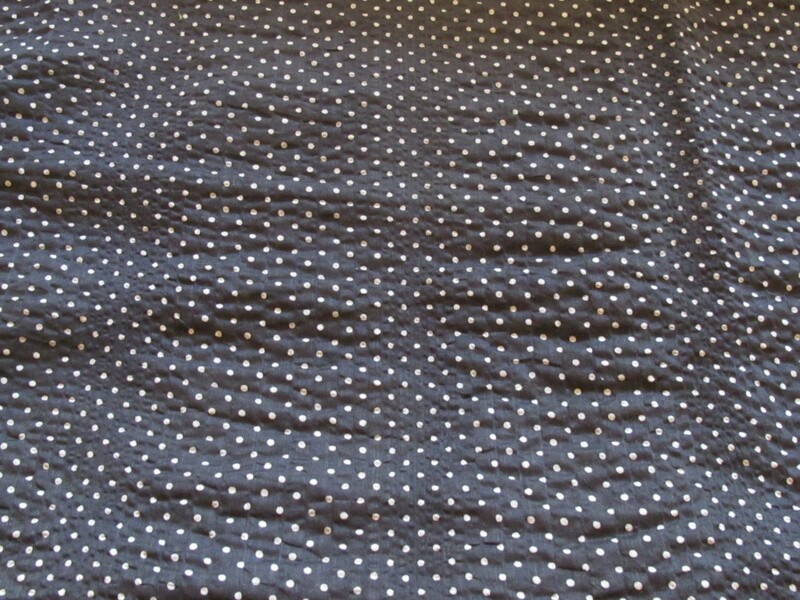 It is a dense fabric, and absolutely perfect for dresses, skirts, without any need for another layer. The right side of the fabric features a ribbon applique in ribbon and rosette patterns. There’s a good length here. The fabric is 145cm and the length is 3 metres. The piece is $24. 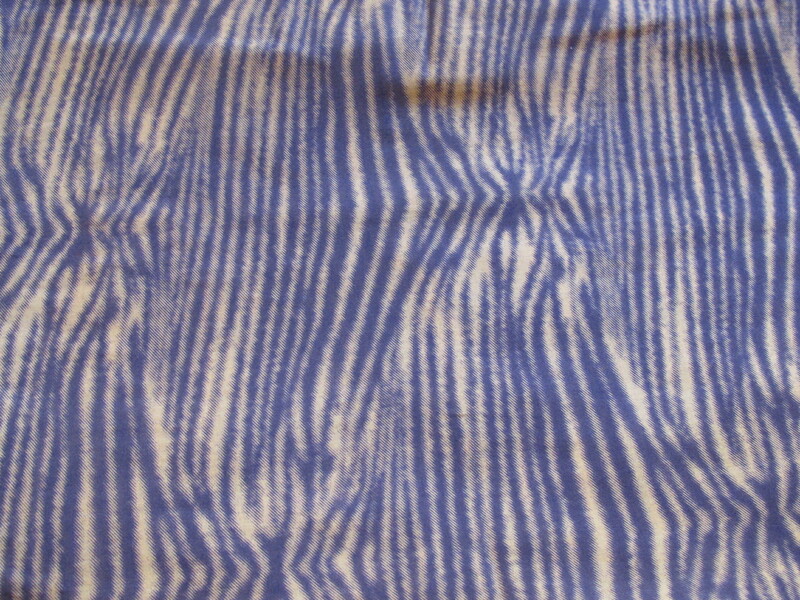 This is a lightweight cotton, it is a voile. Garlands of flowers in deep blues, plums and greys adorn a background colour that is a very deep and dull purple, so deep it is almost a black. I’m just not 100% sure where I got this fabric. 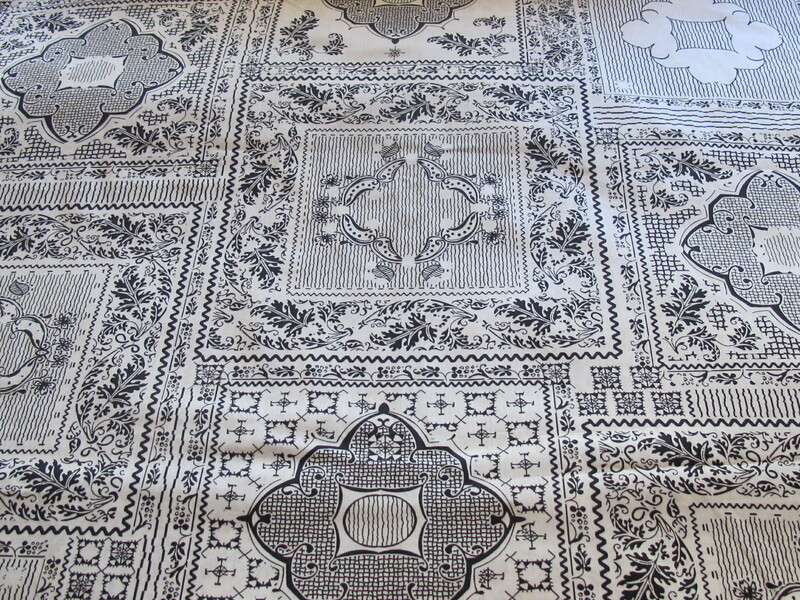 The fabric width is 150cm and the length is 2 metres, price for the piece is $16. Such a pretty, delicate little print this one. 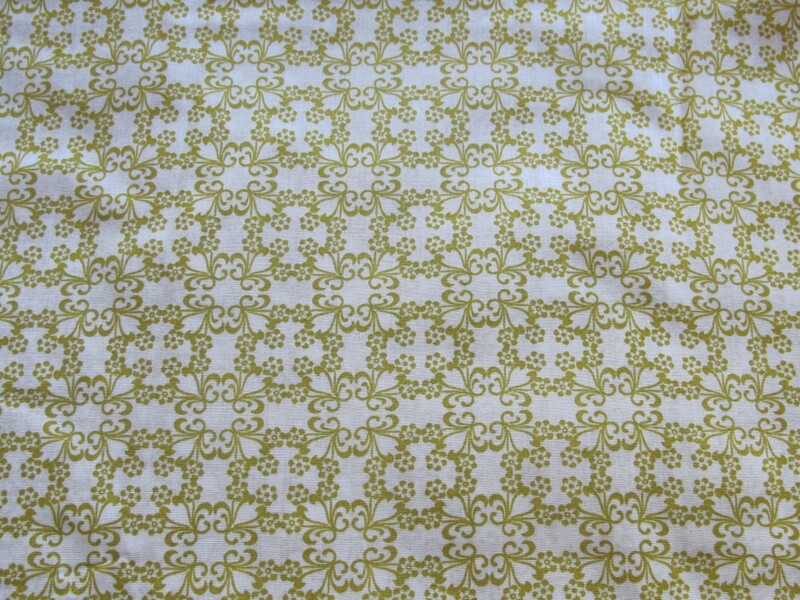 This is a lightweight cotton with considerable opaqueness for a lovely light cotton. The Japanese do fabrics so well! The print features a repeating motif of a small stylised flower again an ivory background. 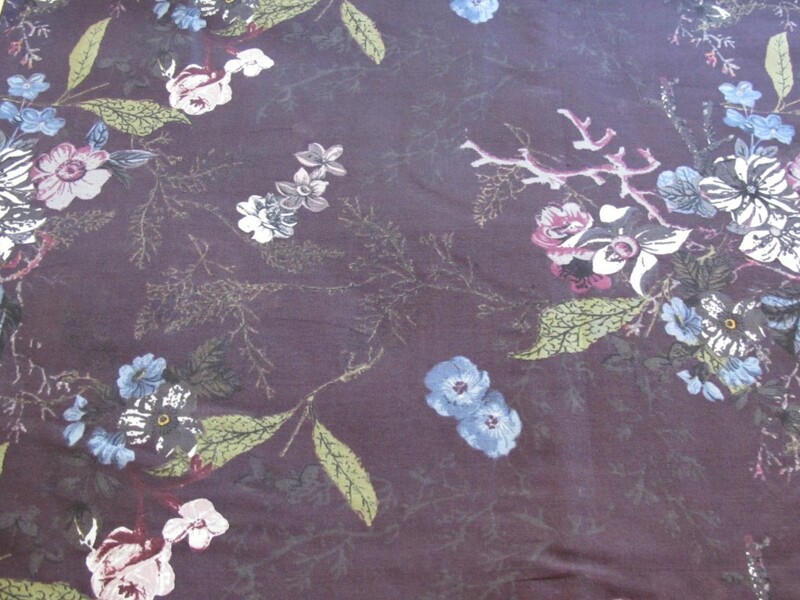 The fabric width is 110cm and the length is 2 metres, so $16 for the piece. 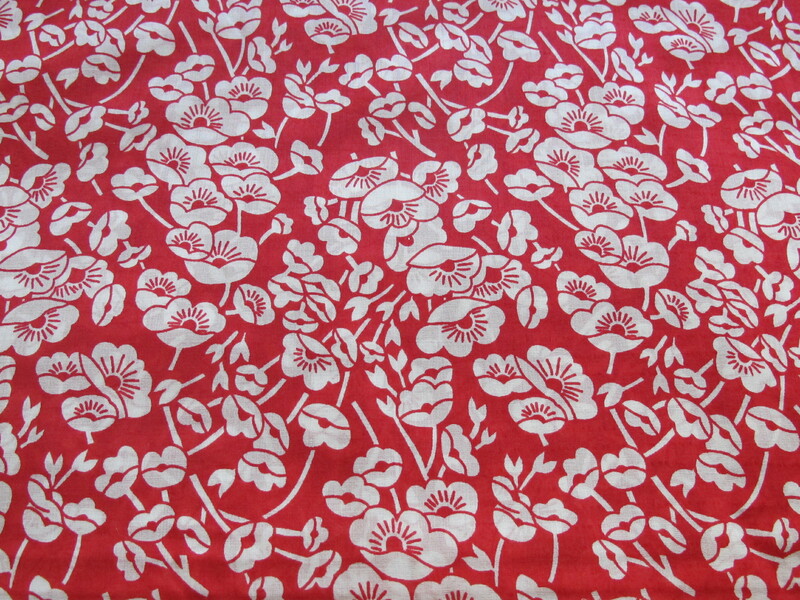 In the mood (hint) for a pretty little red and white flower cotton? I love these red and white prints, so of course I’ve accumulated a variety of them over the years and it’s time to let some go. The width is 135cm and the length is 2 metres. I paid a whole lot more that $8 a metre for this one but the piece is yours for $8. Sob. Just because I am putting these fabrics out, doesn’t mean I don’t have a great affection for them. This one came from the cotton corner at M00d and I seized on it straight away. Fellow lovers of brown might identify. Probably you won’t if you like pale pastel colours! Carolina Herrera often uses these brown and cream shades together and I love what she does. This is lightweight but opaque, a lovely cotton that cost a lot more than I am putting it up here for. 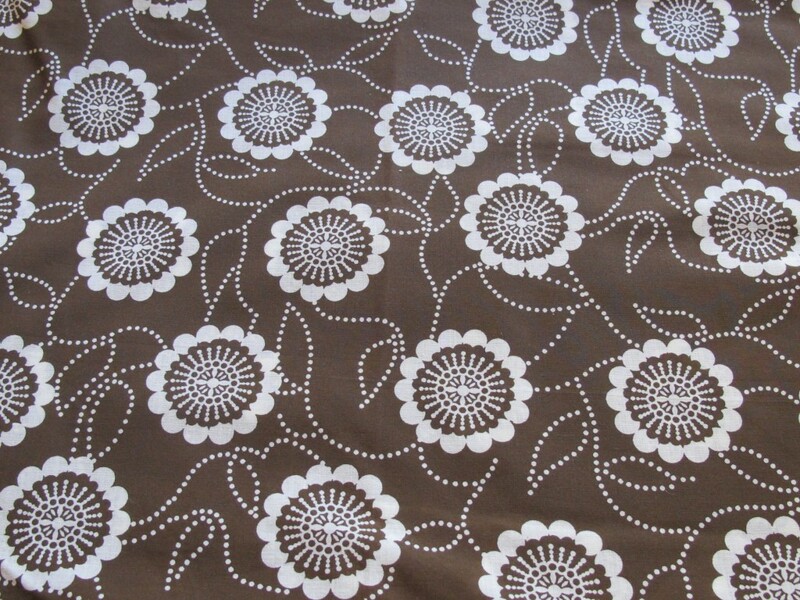 The fabric width is 140cm and the length is 2 metres, so $16 for the piece. Please read the listings for the immediately preceding two fabrics — I can say the same thing all over again for this cotton. 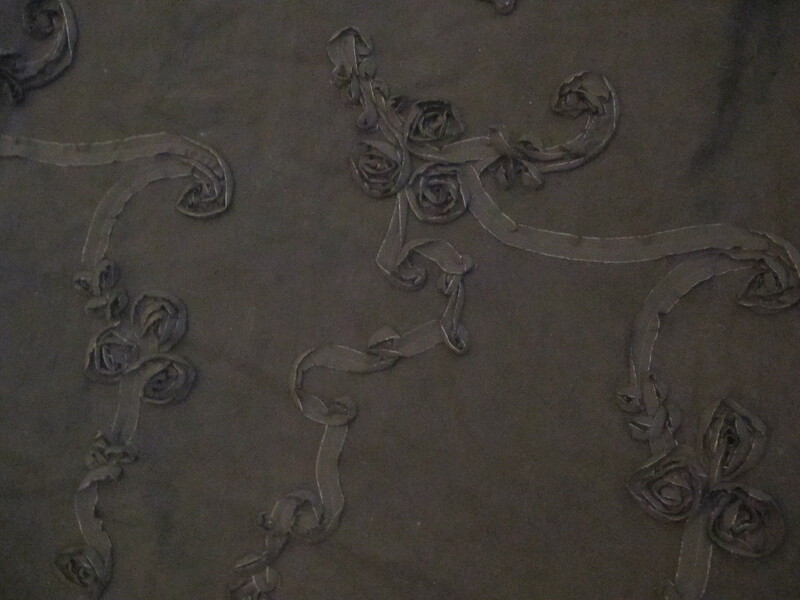 It is from the same place as the other two, a fabric price going north and I leapt on this piece as soon as I saw it. But I will grit my teeth and push on. What is the name of the fabric type with the tiny dots in the background weave. The image may not show it, but that is the base fabric, which is a lightweight, semi-opaque dream. It is a very good quality cotton. 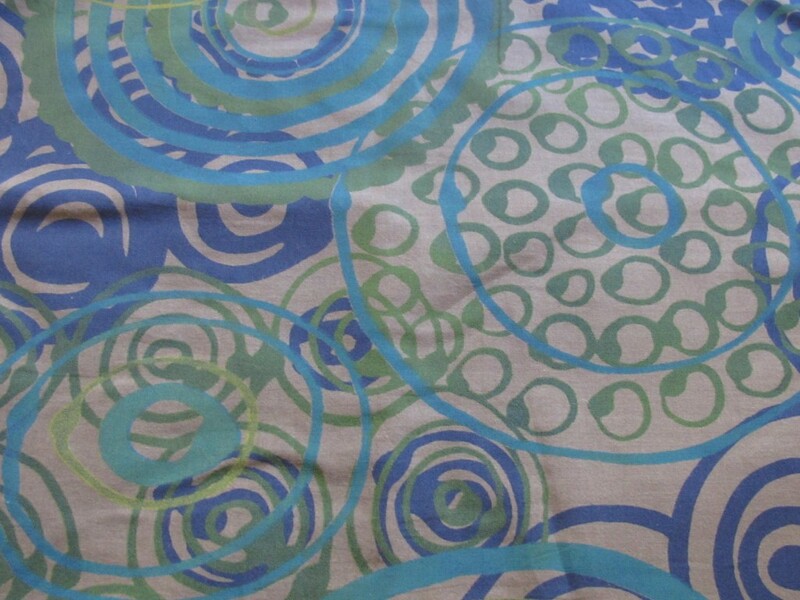 The fabric width is 140cm and the length is 2 metres, so $16 for the piece. Here is a lightweight cotton, completely opaque, with a mid-grey background colour and flower garlands in classic chintz print styles in lovely antique colours. 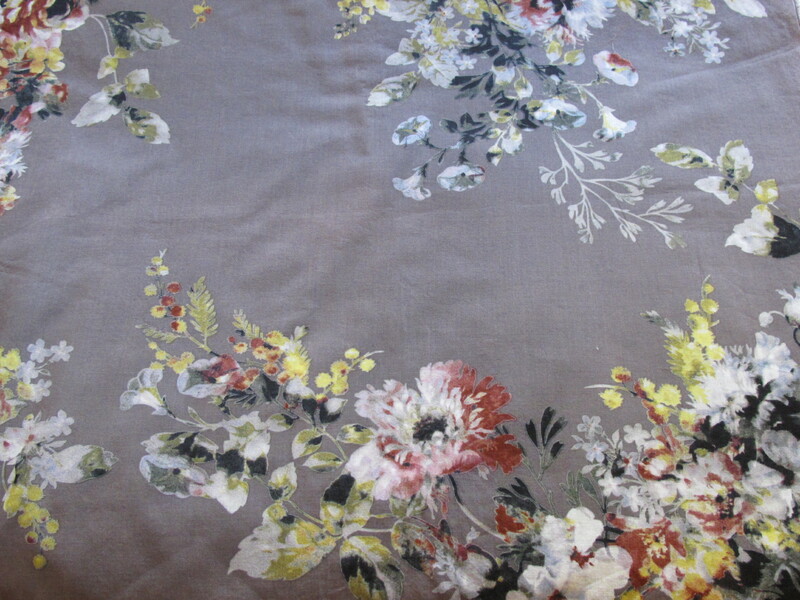 The fabric width is 110cm and the length is 2 metres, $16 for the piece. The designer Marni uses this brown/pink combination on a repeating basis and I’ve seen her do garments with a fabric very like this. For a bit of inspiration, just check out some of the Marni images on Pinterest to see the really interesting cuts she brings to tops and dresses. But this can be a classic shirt or a simple sundress…whatever you like. It is a lightweight cotton, not 100% opaque but very close, good quality. And there is length! 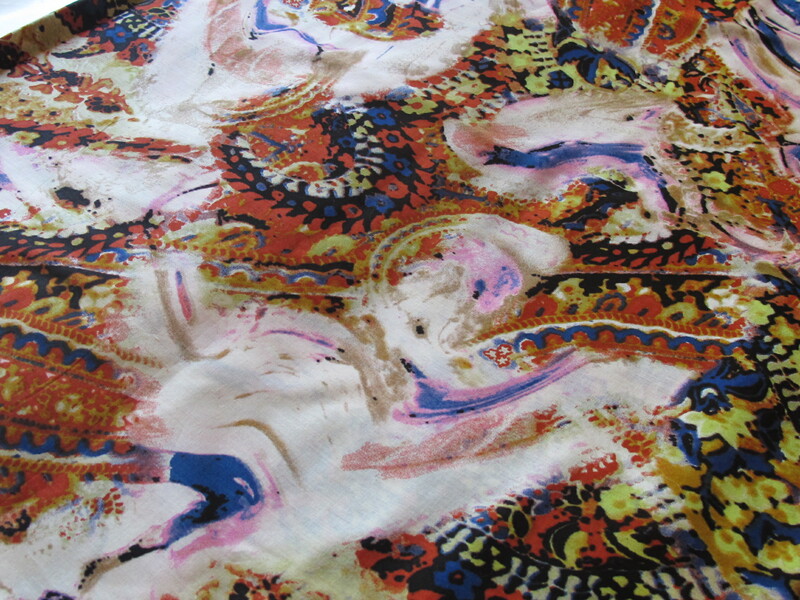 The width of the fabric is 130cm and the length is 4 metres, so this piece is $32. 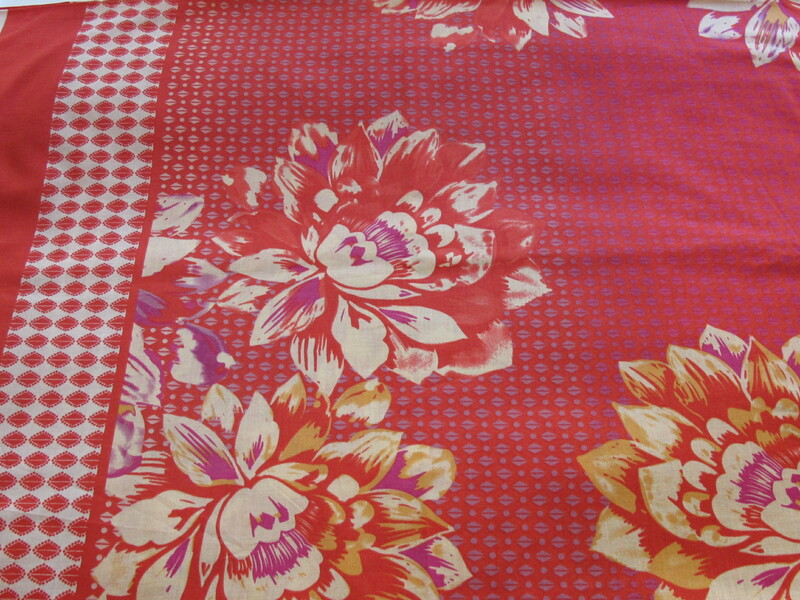 Perfect for our Aussie summers, here is a border print cotton that you can simply hem for an easy sarong for hot days, or you can take more construction to an easy dress, or top where you take the graphic border and use as a button band or sleeve cuff. The border, the buttercream graphic strip on the left in the image below, is repeated at both ends. The big flowers adorn the middle. It is a light, soft and mostly opaque cotton that measures 140cm x 2 metres, so that’s $16 for the piece. This one is a densely woven but very soft cotton with quite a nice drapey hand to it. The graphic is based around an irregularly repeated tile effected, with black tiles etched against a white background. The fabric width is 145cm and the length is 1.6 metres, so the piece is $12. Here’s a fine cotton with a dense weave with a small amount of lycra for wearing ease, soft surface but with a little crispness too like a classic shirting cotton. 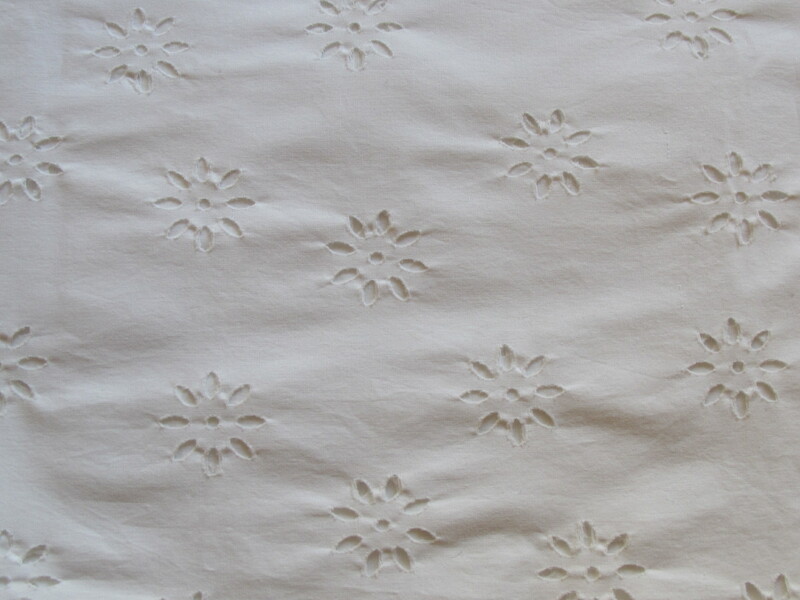 The print features a very small-scale grid/check with lightly etched flower outlines in the background. The fabric width is 135cm and the length is 2 metres so this is a $16 piece.